The Millennium Development Goals (MDGs) are the most broadly supported, comprehensive and specific development goals the world has ever agreed upon. These eight time-bound goals target poverty, hunger, maternal and child mortality, disease, inadequate shelter, gender inequality, environmental degradation and the Global Partnership for Development. Nigeria is still woefully behind in achieving the UN Millennium Development Goals, despite earnings of more than $300 billion from oil revenue annually, Nigerians remain among the poorest in the world. The necessity of mobilizing citizens at the grassroots to hold their leaders responsible for the achievement of the MDGs compelled PADEAP Nigeria to partner with the United Nations Millennium Campaign in 2006 to pioneer what was then known as The Stand Up campaign in Northwest Nigeria. Since then, the campaign has grown with remarkable results as citizens increasingly engage governments at local government and state levels for better service delivery. The campaign is currently known as Stand Up, Take Action! Over 8 Million people in the zone have directly or indirectly displayed increased awareness and support for the actualization of the MDGs in 5 states of Northwest Nigeria. PADEAP collaborated with a number of strategic partners to widen its thematic and geographical scope in awareness raising and support mobilization for the MDGs. In Kebbi State, respondents of the simple citizens’ evaluation scorecards indicated that most of the MDGs may not be actualized with the present pace of development in the state. One major highlight of the campaign this year was the anti-poverty march procession to the Government House with clear MDGs demands boldly written in both Hausa and English. The rally procession, led by our Kebbi campaign partner, Mindset Community Development Action Initiative, demanded to be addressed by the governor. In Zamfara State, our partner, Millennium Development Centre Gusau, organized a one-day awareness raising programme for the physically challenge on their role in holding government accountable for their promise to achieve the MDGs. The event was meant to be a platform for increasing the awareness of the MDGs among the disabled community while also providing a unique opportunity for increased advocacy on the need for more inclusion and participation of persons with disabilities in key policy making process in the country. The crux of the event was the drafting of a communiqué by the participants on key issues affecting people with disabilities and the attainment of the MDGs by 2015. Our campaign partner in Kaduna, Prime Initiative, collaborated with Civil Society’s Coalition on Education for All CSACEFA to organize a one-day event on Civil Society’s advocacy for the MDGs. A major highlight of the event was the commitment obtained from the government representatives and other stakeholders who attended the event by signing on the MDGs campaign ball. In Sokoto the campaign team led by Community Centre for Development Sokoto paid an advocacy visit to the Sultan’s Palace to further garner support for the MDGs by enlisting the sultan’s ownership of the campaign. 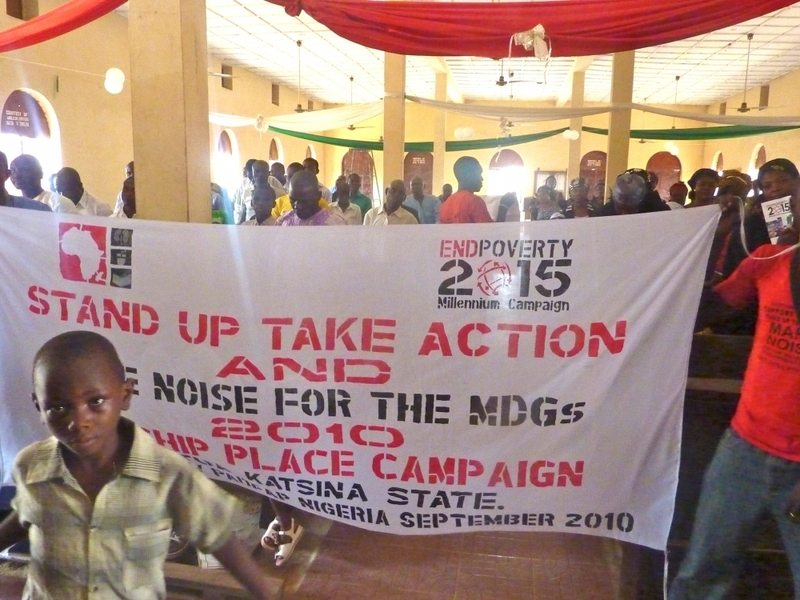 PADEAP will continue to support citizen’s voices from the grassroots as they continue to call on government and other stakeholders (local and international) to expedite action towards achieving the MDGs; holding them to the promises the have made to eradicate extreme poverty and hunger by 2015. We will continue to mobilize the people to remind their leaders that the minutes are counting!